At Upstate, we are seeing a growing trend in the number of students choosing a dual degree path. As we all know, becoming a physician is a long and involved process that requires a dedicated focus. This kind of concentrated effort need not ignore the variety of interests, skills and abilities of our aspiring doctors. By combining the M.D. with another degree, students are able to explore additional interests and, ultimately, expand their career options and allow them to impact the health of our communities in varying ways! For more information, visit the MD/PhD website. 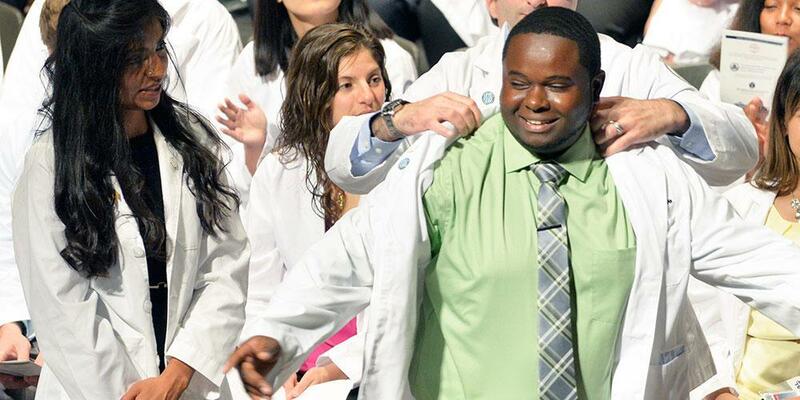 The mission of the MD/PhD program at SUNY Upstate Medical University is to train future physician scientists who, by combining the practice of medicine in the clinic with biomedical research in the laboratory, are uniquely trained and focused to bring the power of modern science to our understanding and treatment of human disease. The program is committed to the recruitment of students with diverse educational and cultural backgrounds who, having a passion for research in the biomedical sciences and clinical care, are dedicated to becoming caring academic physicians. This program is structured so that entering students complete the first two years of the Medical School curriculum, participating in research activities during the summer. Students then select a laboratory for their doctoral research and complete their PhD thesis before returning to Medical School for their 3rd and 4th years of clinical training. Keeping the public healthy is the overall goal of the CNYMPH Program. By building on the combined strengths of Upstate's College of Medicine and Syracuse University's Maxwell School, this joint venture provides a variety of opportunities to a diverse group of students who are also seeking to impact the health of the population. The CNYMPH program provides a unique opportunity for those currently employed or being educated in the region. Students interested in applying for entrance to the MD/MPH Program at the SUNY Upstate Medical University will need to have completed all of the requirements for admission to the College of Medicine as outlined in the admissions package. Prospective applicants will submit their AMCAS application indicating the combined MD/MPH degree option and follow the regular AMCAS application process. For more information, visit the MD/MPD website. Last Modified: August 30, 2018. Contact Chris Liberty with questions about the content of this page.